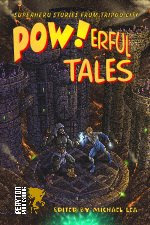 The Peryton Publishing site now has some more information about the Pow!erful Tales anthology, which is due to be printed by the end of the month. I also heard from the editor that they have decided to illustrate all the stories in the end, so even my very short story The Ironic Man will have an illustration. This will be my first anthology appearance and I’m really looking forward to seeing it.